The project would provide a safe way for pedestrians and bike riders in Cardiff to cross the railroad tracks to access South Coast Highway 101 and the beach. The only other legal places to traverse the tracks, Chesterfield Drive and Santa Fe Drive, are about 1.3 miles apart. Verdi would provide a third crossing roughly halfway between the two existing ones. Specifically, the proposed plan is to install pathways west of San Elijo Avenue near Verdi and Liszt avenues. Those paths would allow pedestrians and bikers to cross the Coastal Rail Trail (currently under construction) and go under a bridge that will be built to support the railroad tracks. Once past the bridge, pedestrians and bikers will turn northward and arrive at a street-level crossing at Highway 101. According to city consultant Christy Villa, it’s unclear at this point what the Highway 101 crossing will entail and whether a signal will be installed there. So far, the City Council has allocated $1,784,019 to HDR Engineering, Inc. for the project, which provides funding through the phases of design, environmental documentation, permitting and public outreach. Villa, Peltz and other team members presented the project’s background and design plans to the public on May 21 at Cardiff Elementary School. About 50 people attended. An audience member commented that SANDAG hosted similar public hearings about the Cardiff Rail Trail but “didn’t use any of our input.” Villa assured him that public input was welcomed and had the potential to impact the final design. She encouraged attendees to fill out the commentary cards with suggestions. Villa plans to host one more community meeting but is open to more if needed. The tentative design concepts, which could change based on community input, attempt to create a unified “palette,” as Villa called it, that blends well with the appearance of the Santa Fe crossing and the Coastal Rail Trail. 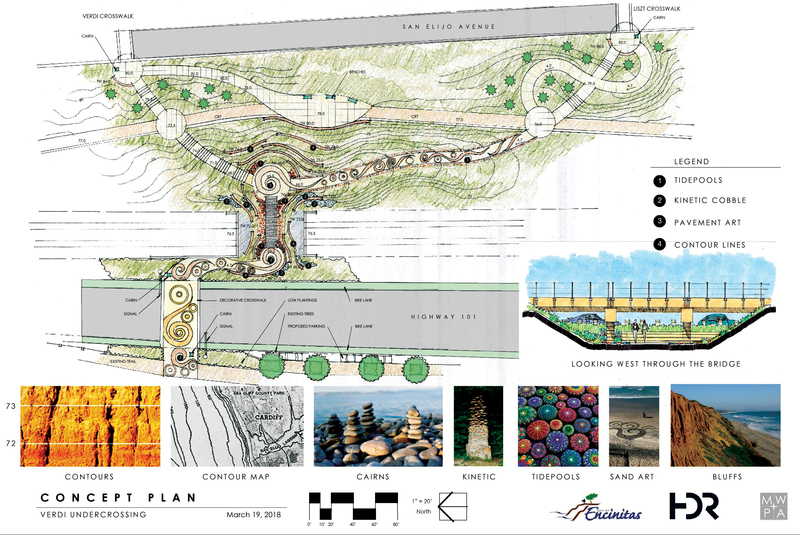 The Verdi path would be ADA compliant and lead to a viewpoint east of the tracks that provides ocean views and benches. To mark entry and exit points of the path, Peltz recommends monuments that resemble the stacked stones, called cairns, often placed along Cardiff beaches. Peltz’s design would capture the essence of sand art by drawing swirls in the path’s wet concrete that resemble whimsical sand etchings. Those imprinted designs would “represent Cardiff and the spirit of the people who live here,” he said. Tide pools inspired Peltz to incorporate colorful rocks that resemble sea anemones into the design. He suggested having local students paint them. Passersby would see the rocks as they looked down in a way that Peltz compared to people stepping across tide pools and noticing the living creatures below. Noting that he loves the way retreating surf pulls rocks backward with a gentle knocking sound, Peltz recommended suspending rocks on rods to allow the wind to simulate that auditory impression. The proposed design would also feature a series of walls in a terrace between the viewpoint area and the rail crossing. Instead of being smooth, the walls — like the local sea bluffs — would contain grooves. Metal pieces would be incorporated into the wall surfaces that approximate contour lines on topographic maps. The contour lines, in this case, represent each foot in elevation gain. Because the slope from the rail underpass to the highway is slightly uphill, a sump pump would have to be installed between the tracks and Highway 101 to handle water from rain and drainage flows. A backup system is also required, making this aspect of the project expensive, although no specific cost was given at the meeting. No city funds have yet been earmarked for the project’s construction — estimated to cost about $7 million — but HDR is pursuing grant opportunities that could unlock the key to financing it. In addition, Keller’s report recommends that City Council pay HDR an additional $50,000 (plus 10 percent contingencies) to prepare an Active Transportation Program grant application. The council will vote on that recommendation on May 23. An ATP grant, which has a July 31 deadline, could finance up to $4 million in construction, according to the report. A different ATP grant was awarded to the city in 2015 that funded 88.5 percent of the El Portal railroad crossing, now being built in Leucadia. The estimated $8.8-million project will finish its preliminary engineering and environmental clearance this summer. The final design is slated for spring 2019. Construction, according to HDR, could start in summer 2019 and finish a year later, but that depends on funding. One meeting attendee said that maybe the “Cadillac” plan being proposed should be scaled back in order to speed up the process. She’ll soon lose her beach access and wants this new crossing installed quickly. The fence for the Coastal Rail Trail will prevent frequent (but illegal) track crossings in Cardiff. Villa responded that the aesthetics of the project will not impede the speed at which the undercrossing is built. Land is the theme of the undercrossing project and also the budget obstacle. The cost of grading and retaining land — and constructing pathways over and through it — presents a financial hurdle to Encinitas that grants may or may not resolve. Another botched project by the City Council. We need to preserve beach access during and after construction of the rail trail. Otherwise I predict a lot of “illegal” crossings, problems with the fence and a lot of unhappy voters. The city council needs to find a better interim solution. 2020 under a best case is unfathomable.